L’Hospitalet de Llobregat Town Council. A NON-PLACE TURNED CENTRAL PARK: The main idea was that in order to become a place the area needed a central core, coherence, and an identity of its own. „We tried to take advantage of the area’s overall regeneration so as to get rid of the logic of the traffic junction surrounded by residual green spaces and replace the latter with just one comprehensive park crisscrossed by a number of roads,” the architects explain. Meanwhile mechanisms capable of connecting important elements of different scales that existed in the adjacent territory had to be identified; these elements included a hospital, a graveyard, schools, sport grounds, dwellings. In fact what the project did was to „knit” back a place, taking into account all the impulses that came from various directions which architects usually have no chance to address. Pedestrians are not welcome beyond the city, at the junction of major traffic routes, along motorway and railroad protection areas, in the vicinity of bridges and tunnels. City technical spaces are not humanized, at best they are given a human touch. To make them more accessible and livable, one needs projects that look at the neighborhoods and visual barriers and barriers that have to do with understanding, and by virtue of these all finally rediscover those areas as places. 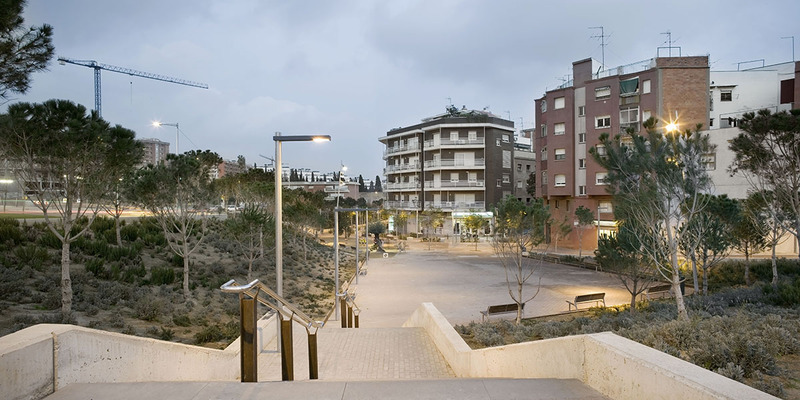 In this case all the elements that shape up the urban space contribute to stress the feeling that one is in a park or a square rather than on the side of a motorway: trees are placed at the intersections of the orthogonal grid, the fencing wall of raw concrete is a parapet and bench rolled up in one, urban furniture has elaborate metal trailing. Combinations of materials and textures (the balustrade is a combination of Corten steel props and stainless steel handrail) reproduce the hard lines that rule the (non)-place, in an attempt to recover its character. 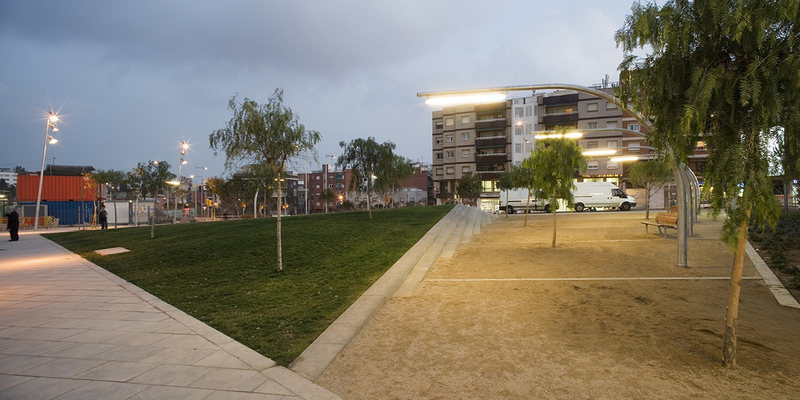 The park thus emerged is a typically Barcelona space bordering on both the green space and square concepts: “hard” paved areas in which trees draw compositional lines, stress or direct one’s gaze; green slopes, stairs and parapet-benches; a completely accessible and usable space with no psychological barrier to prevent one from entering the “green area” covered in grass. Understandably, the limited use of grass is prompted by Mediterranean weather, but the continuous lime stone surface, accessibility and the trees planted in the middle of the squares simply to mark a vertical line are all part of what is already known as a Barcelona trade-mark – an urban space design style which emerged in the 1980s, one that continues to draw as much as admiration as criticism. LIGHT IN THE MIDDLE OF THE TUNNEL: A pedestrian who needs to get from Barcelona to L’Hospitalet has to use the “tunnel” that crosses under Collblanc Road. Before the intervention, the narrow, dirty, badly lit tunnel did not diﬀer from any of the pedestrian passage ways build during the last century. 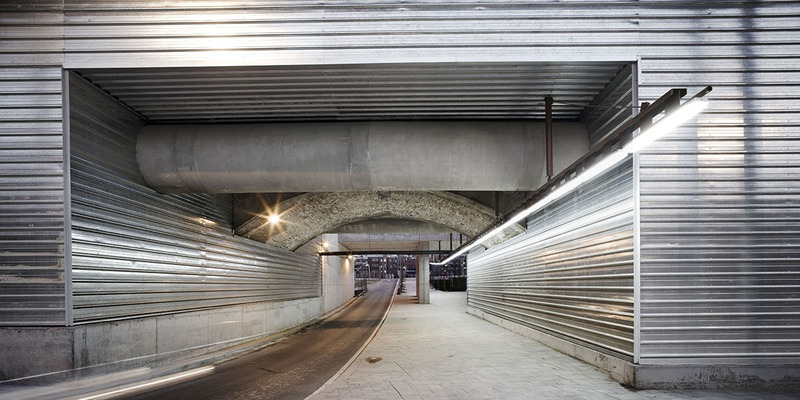 Territori 24 architects reversed the terms of the issue, giving pedestrians rather than cars the right of passage, by broadening the tunnel and introducing a light pit in the middle, thus bringing natural light where it was most needed. 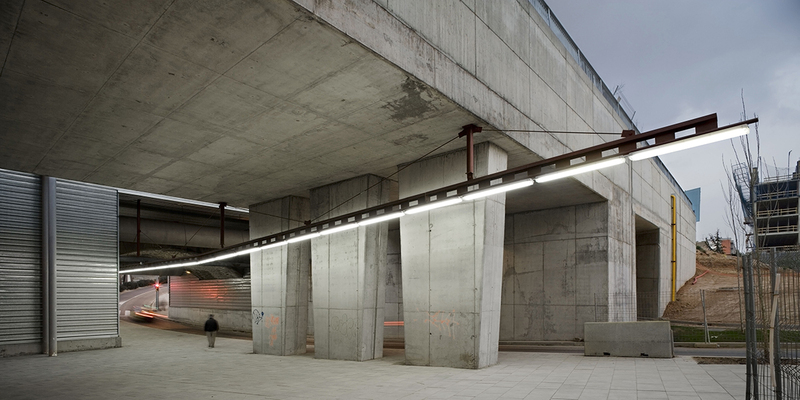 A lighting line suspended from a Corten steel structure goes beyond the passage limits into the open space, generating continuity and softening the access into the underground passage way.